Homemade apple pie spice is a simple way to add a ton of flavor to pies, cobblers, and other desserts. It’s fragrant, versatile, and easy to make. Apple pie spice is something that can be found in any baking aisle. That’s all great if you don’t forget to buy it like I did last week. John wanted an apple pie, and I managed to purchase all the necessary ingredients except the apple pie spice. Going back to the supermarket wasn’t an option, so I started pulling all the herbs and spices out of the cabinet. I decided to put together my version of apple pie spice. All I needed was four simple ingredients and voila! Lucky for me, I was able to make a quick and simple substitute for the store bought version. Unfortunately, this wasn’t the first time we’ve run out of a spice blend. We also created an easy homemade taco seasoning and quick pumpkin pie spice when we needed them in a pinch. John said he prefers my homemade version over the store bought, and I agree. We can adjust the flavors as needed and make as much or as little as we like. Homemade apple pie spice is a new staple in my spice rack. I will never purchase the store-bought version again. In a small bowl add the cinnamon, ground nutmeg, allspice, and ground ginger. Stir well to combine. Store in an airtight container. Use as needed in a variety of desserts to add a lovely, spiced flavor. Apple pie spice can also be made in an airtight container. Simply add all the ingredients to the container, pop on the lid, and shake until combined. There you have it! It’s just that easy. If you like this homemade apple pie spice recipe, please leave us a comment and rate the recipe card. You can also find us on Facebook, Pinterest, Twitter and Instagram searching for Berly’s Kitchen! 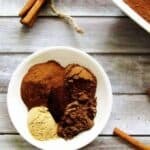 Homemade apple pie spice is a simple way to add loads of flavor to pies, cobblers, and other desserts. It's fragrant, versatile, and easy to make. Use in pies, cobblers, or other desserts. Wow! I can’t believe how easy it is to make apple pie spice! Here I was, thinking it was something tough, and that’s why we were buying it! I’m so excited for the crisp freshness of fall to be here, so we will have fresh apples to make some apple pie! 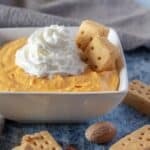 I can almost smell autumn when reading that recipe! All those smells and flavors will combine to make an absolutley delicious combination. What a great addition to an apple pie or even a crumble. I will have to keep this in mind in the future. Homemade is always better than store bought! i never considered making my own apple pie spice since I seem to have all the ingredients in my house already. Not that I make apple pies a lot but definitely think why now that I have the recipe. But I love the idea of adding it to baked apples topped with ice cream as a quick weekday snack/dessert. Definitely bookmarking your recipe. My 9-year-old is obsessed with pumpkin pie spice! She wants it in everything. Can’t wait to try this variety to spice it up with her a bit! Love the pictures and the recipes. With all the spices, this is going to be one healthy Apple pie! I love this time of the year and the smell of something coming fresh out of the oven. I have tasted so many delicious apple pies and when they are homemade, they never disappoint. I love how this recipe for apple pie spice is so easy to make. I come across a lot of pie recipes but none that show you how to make the spice! Love this. I have never tried making spices before by mixing some other spices together. I do know how important that spice is for some pastries that I have made. I think that trying to get the spices freshly ground would make the homemade apple pie spice even better than just ones in a bottle. Homemade is always better than store-bought. Glad that your husband liked it too. I love spices except cinnamon though, but this sure will make a really delicious apple pie. I was looking to make a home made apple pie, I;m glad i found your recipe . Thank you now i guess am ready, If you could give a recipe for using your recipe that would help, Apples is what i plan to muse. Hi! Thanks for stopping by! We have a couple of recipes that use the apple pie spice. Here is an apple pie recipe and an apple crisp recipe. Both are really tasty. 🙂 Have a great weekend!